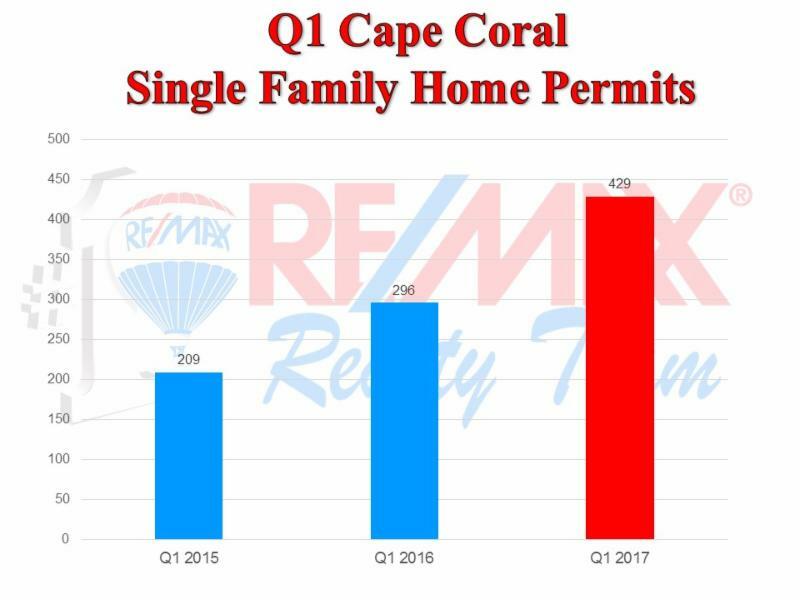 429 New Home permits were issued in Cape Coral for the first quarter of this year, a 45% increase over the same period in 2016, and more than double the permits of Q1 2015.. These permit numbers are quite welcome, as more new homes will help keep inventory at a reasonable level, which in turn will keep prices from rising too high - too fast. On a yearly basis the new home permits would equate to about 1,700 new homes being built per year in the city. The U.S. Census Bureau projects approximately 10,000 people per year will relocate to Cape Coral for each of the next ten years. This means we need about 3,200 new homes built per year, and that does not include "seasonal home owners". Based on these calculations, new homes are being built at about half of anticipated need. Tom: the number of new homes needed in the Cape is a big reason I expect lot prices to keep rising at double digit appreciation rates. In the first four months of this year there have been 17 homes sold in Cape Coral that were listed for $1 M or more, with six of these high-end sales occurring just in April. In all of 2016 only 28 homes were at the $1 Million mark. The highest priced home sale this year was $2.2 Million at Tarpon Point Estates. Tom:At this rate, the Cape may well have more than 50 home sales that reach the $1 Million threshold. We are seeing a growing number of new homes with 3-car garages, and most of the time it's not to park a 3rd car. No, the reason many new construction homeowners are yearning for a 3-car garage home is for storage. Many northerners who have large basements and/or attics are needing the extra garage space for storage. Taller garage ceilings also allow for overhead storage racks. Sue: We think in the coming years a 3-car garage will be viewed as almost a necessity, similar to when 2-car garages replaced 1-car garages, which were common in the early homes built here in the 60's & 70's. Florida Residents get Good Services for Taxes Paid: If ROI (return on investment) is applied to taxes, a Wallethub study ranks Florida third in the nation for the value residents get from the state taxes they pay. For the analysis, 23 metrics to compare the quality and efficiency of state-government services across five categories - education, health, safety, economy, and infrastructure and pollution. Cape Homes Continue Upward March: Average Cape Coral home prices in April were $287,000, a 13% increase from April 2016. Inventory remained below 4 months - a continued shortage of available homes for sale. Florida #5 in U.S. for Commercial Development: By sector, the state is third in retail, third in warehouse/flex sectors and seventh in office space. NAIOP Research Foundation measured GDP, salaries and wages, and jobs created and supported from the development and operations of commercial real estate. U.S. Home Inventory Drops to 2.7 Months in March: According to RE/MAX National Housing Report, the average inventory of homes for the country was only 2.7 months. The number of Days on Market before a sale contract is signed was only 64 days. Both of these indicators are way below normal. Although they are national averages, they bode well for SWFL because many people who plan to buy here soon need to sell their current home in other states. Lenders Highly Optimistic about 2017: A survey of 200 lenders by Lenders One Cooperative, found that 94% of lenders expect an increase in mortgage loans this year, up from 62% in 2016. 59% of lenders expect an increase in first-time homebuyers this year. Tom: first-time homebuyers are a crucial component to a healthy real estate market. Home Sellers in Q1 see Nice Price Gain: ATTOM Data Solutions reports that homeowners who sold in the first quarter of 2017 realized an average price gain of $44,000 since purchase - an average 24% return on the purchase price. This was the highest average price gain in terms of both dollars and percentage returns since the third quarter of 2007. Homeowners Staying Put Longer: A new report shows that homeowners who sold their home in the first quarter of the year owned for an average of 7.97 years. Before the great recession, homeownership averaged 4.26 years. Tom: My take on this longer than normal homeownership tenure is due to 3 reasons:1. Lost Equity - many owners were underwater until recently (a small percentage still are), thus could not afford to sell their homes. 2. Low interest rates - people who locked in when interest rates were in the 3 to 3.5% range are now reluctant to sell and buy a home with a higher interest rate. 3. Low inventory - owners don't want to move without confidence that they'll be able to find a suitable replacement home. Although there are many retirees in Cape Coral, not everyone is lucky enough to be at that stage and some of us are still plugging away at full time jobs. If you've ever wished you could clone yourself so you'd have extra time to run errands, grocery shop, meet repairmen or a delivery truck, etc., well we can recommend an excellent solution. For about $30/hour for most services, Michele Gibson will happily help you with these and other tasks so you can have more free time to actually enjoy some of the wonderful leisure activities available to us in SW Florida. Why should retirees have all the fun?!! We can personally attest to Michele's reliability, honesty and pleasant personality. You can reach Michele at 239-707-8792. © 2019, The data relating to real estate for sale on this Website come in part from the Broker Reciprocity Program (BR Program) of M.L.S. of Naples, Inc. Properties listed with brokerage firms other than Luxury Waterfront Team are marked with the BR Program Icon or the BR House Icon and detailed information about them includes the name of the Listing Brokers. The properties displayed may not be all the properties available through the BR Program. BR data on this website is provided by Luxury Waterfront Team on behalf of Tom Demogenes. The source of this real property information is the copyrighted and proprietary database compilation of the M.L.S. of Naples, Inc. Copyright 2006 M.L.S. of Naples, Inc. All rights reserved. The accuracy of this information is not warranted or guaranteed. This information should be independently verified if any person intends to engage in a transaction in reliance upon it. Data last updated 2019-04-21 20:58:56.